People had dreamed of flying for many years. The United States Army was trying to develop an airplane in 1903, but the plane wouldn't fly. The New York Times wrote that maybe in 1 million to 10 million years they might be able to make a plane that would fly. 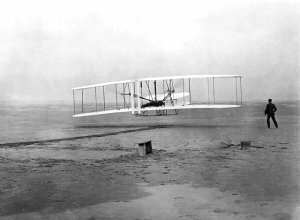 Only eight days later two men were successful in flying the first manned plane. 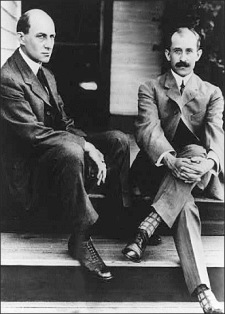 They were Wilbur Wright and his younger brother, Orville. They had made a propeller-driven* airplane and it had stayed in the air for 12 seconds! It was called the Wright Flyer. They made three more flights that day at Kitty Hawk, North Carolina. Only five people were there to see the flights, and very few newspapers even wrote a story about it. The first plane they had built was a glider that measured 16 feet from wing tip to wing tip. It cost them $15 to build it. 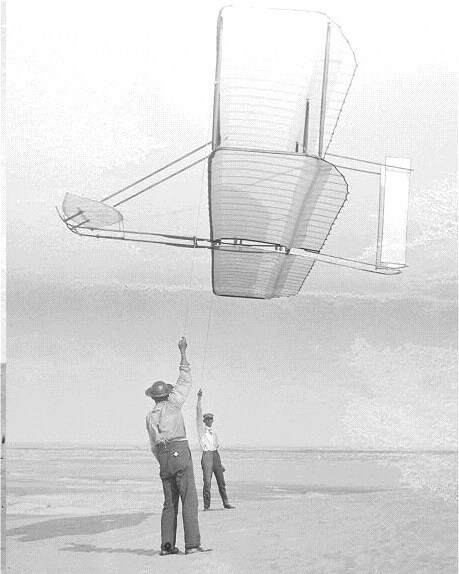 The gasoline-powered plane they flew at Kitty Hawk cost them less than $1000 to build. They learned to love to "tinker"* from their mother. She was always fixing and repairing things. The boys earned money by making home-made mechanical toys. When bicycles became popular, they opened a bicycle shop. They studied birds and how they flew. They contacted other people who were trying to fly. They made a wind tunnel at their shop to test different kinds of wings. 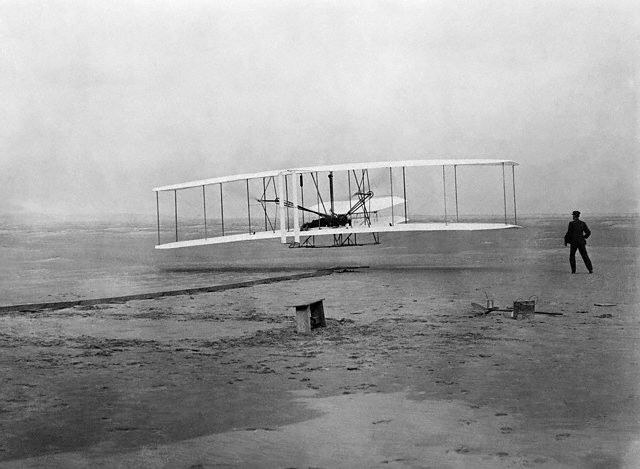 They continued to improve their planes, and five years later Orville remained in the air for one hour and two minutes. A few days later he had an accident in his plane. He had several broken bones and his passenger died. This was the most serious accident they ever had. After Wilbur died of typhoid fever* in 1912, Orville continued to work alone. He sold his interest in the Wright Company and retired three years later. The original* plane that flew at Kitty Hawk was placed in a Science Museum in London in 1928. Twenty years later, the museum sent the plane back to the United States. It can now be seen at the National Air Museum in Washington, D.C.
At biography.com search for The Wright Brothers. Thanks a lot! I have an English assignment for Christmas. I need to make a 20-page book about the Wright Brothers. This page displayed 720,163 times.